Titirangi is in my humble opinion one of the nicest parts of Auckland, especially in Summer. The beauty of the natural area, the bush and tree clad hills and the views of the Manukau Harbour combined with the culture of Lopdell House and Te Uru and the vibrance of the village are to die for. There is nothing more impressive than watching Kereru and Tuis in flight. There are other inhabitants in the area, some of which do not fit in so well. 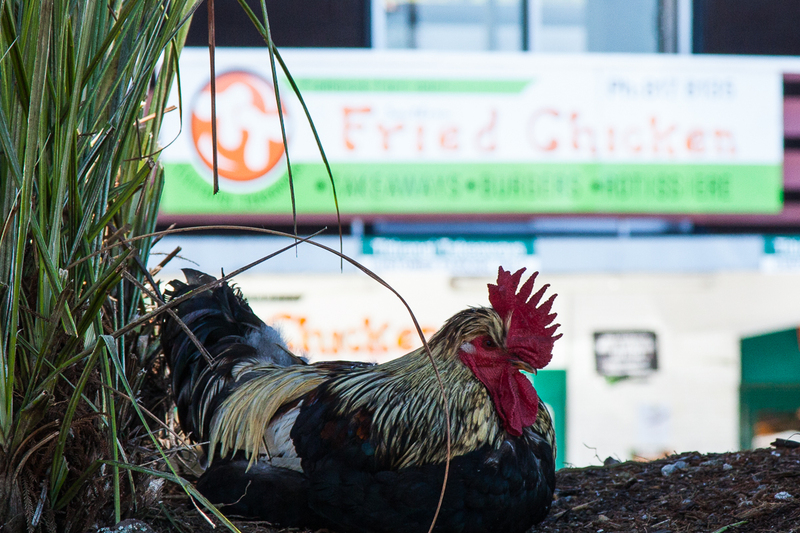 Amongst these are a flock of Chickens and Roosters who have set up residence behind the shops on Rangiwai Road. They are becoming more and more of a problem. With numbers estimated to be over a hundred and with roosters engaging in what roosters do (make periodic loud noises) they are affecting local residents and people who work in the area. The Council has received a variety of complaints about them. Everything from the mess they are leaving on parked cars to excessive amounts of crowing by the roosters. Originally they were cute and considered an addition to the character of the village. But their numbers have multiplied and now they are presenting a real problem. I believe that something has to be done to limit and reduce numbers. It appears that one of the primary causes of the explosion in numbers is that they are being fed by well intentioned locals. I spent a bit of time in the village recently chook hunting and I saw about 25 chickens and roosters. I could not believe how well fed they were. Every chicken I saw was of a very good size. I cannot repeat how important this is but we have to stop feeding them. Continuous feeding will cause the numbers to continue to swell. There are a number of options that can be selected. One option that we will not see is some sort of public mass extermination. You will not see hunters with guns going through the village. Set cages to trap them and then relocate them. I think this is the most humane thing to do. The public could “adopt a chicken”. The Roosters, being the noisy ones, could be targeted and dealt with first. “Sleepy feed” could be used. This drugs the birds and makes them easier to move. The difficulty will be however the effect on native wildlife and also I believe that the results are not the best. I am interested in local feedback. Leave a message or email me if you have any comments or feel free to leave them here. The heading was provided by a local who has a sense of humour but who is staring to suffer from sleep deprivation. They are a traffic hazard on titirangi road and in carparks. Free range chickens should have a safe home not one that is around cars. Not to mention all the chicken crap around the place, just not where chickens belong! Some sort of a cull needs to happen I feel, they are a hazard on the road, their excrement is not pleasant and attracts huge amounts of flies which probably effects all the food outlets. Plus no one wants to see when they eventually get run over. Hi there, I run Battery Hen Rescue and Rehoming. If you would like help to catch and rehome these birds I would be keen to take on the project. However, I’d need a bit more information about numbers and whether someone feeds them at a certain time of day. Feel free to message me through my facebook page. Regards, Angie.